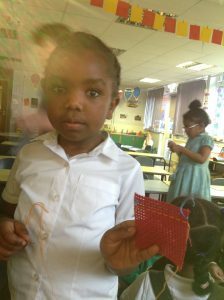 We all did some designs for what we thought could be on our wall hanging and then we decided as a class which colours we were going to use and how we were going to lay things out. 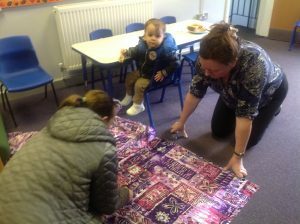 We think the wall hanging is lovely. 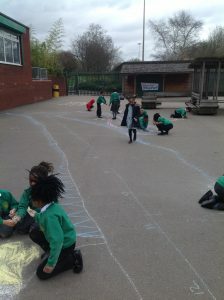 I can’t wait to see the other classes work. 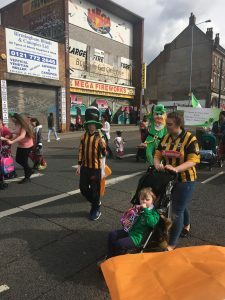 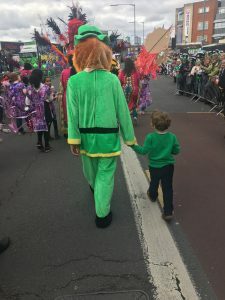 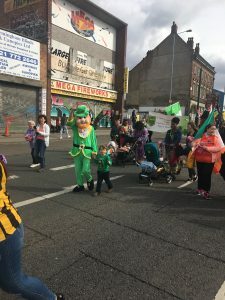 Thank you to all the children and parents for coming to the St Patrick’s Day paraded on Sunday 12th of March. 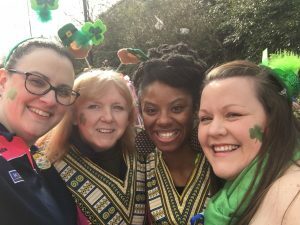 We had a great day. 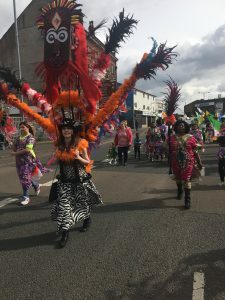 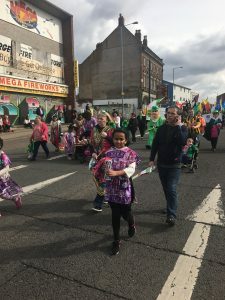 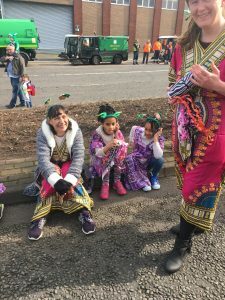 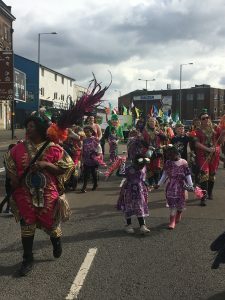 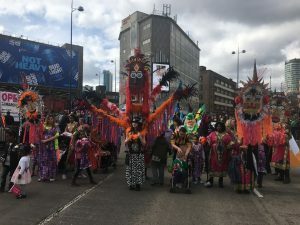 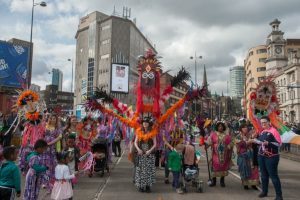 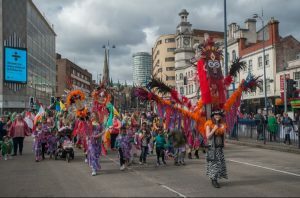 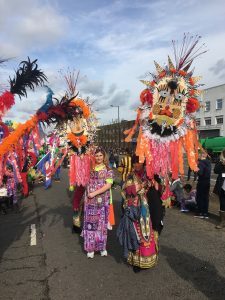 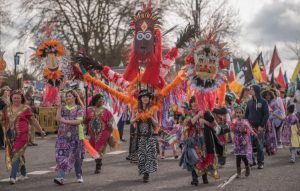 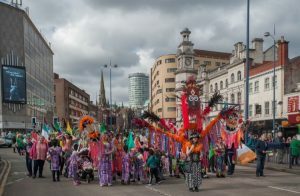 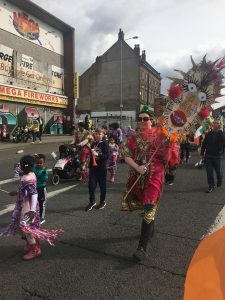 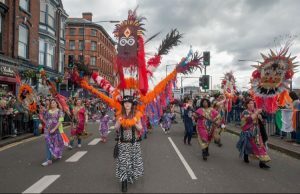 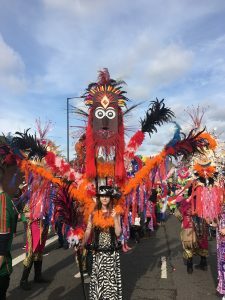 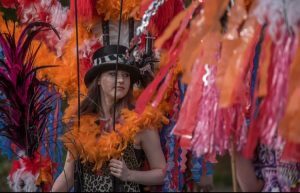 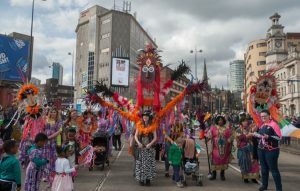 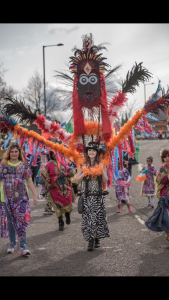 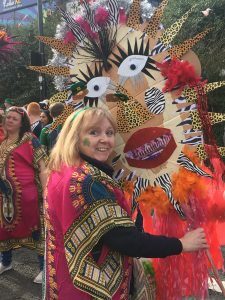 Also special thanks to Garry Jones from ‘Off Your Trolley’ for helping use prepare for the parade and the students from BCU for walking with us and designing our outfits. 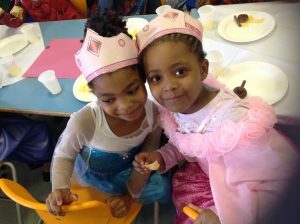 Have a look and see what you think of us. 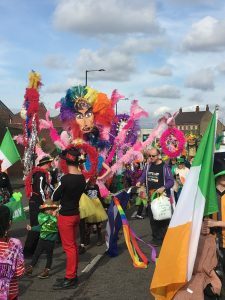 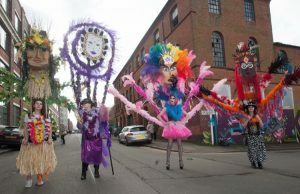 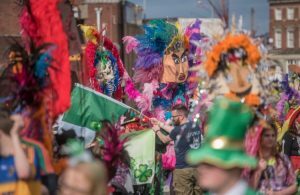 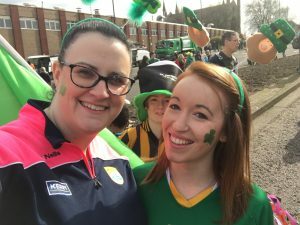 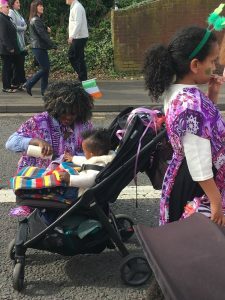 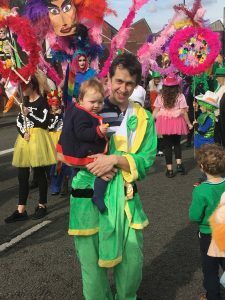 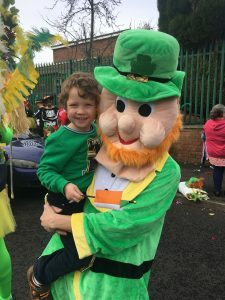 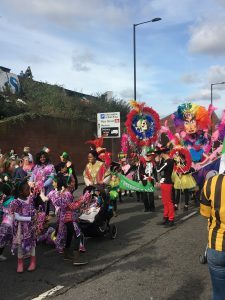 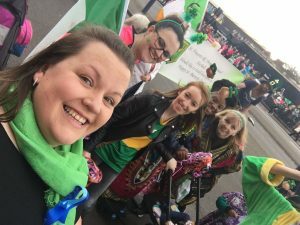 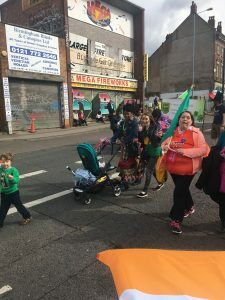 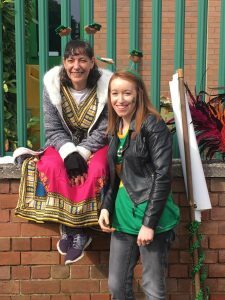 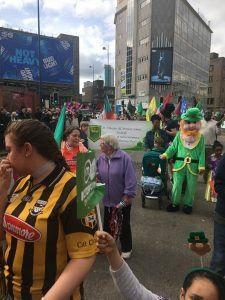 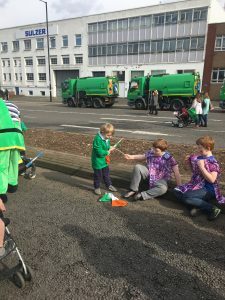 St Vincent’s took part in the St. Patrick’s day parade in Digbeth once again this year. 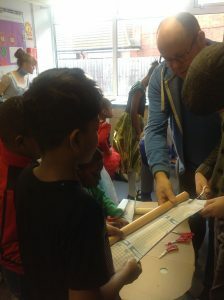 We worked with Garry Jones from ‘Off Your Trolley’. 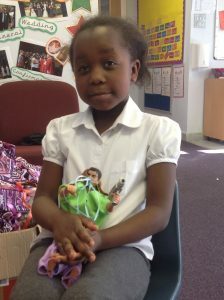 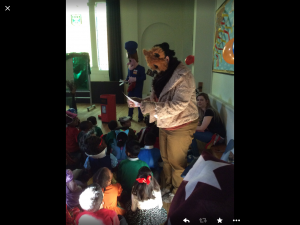 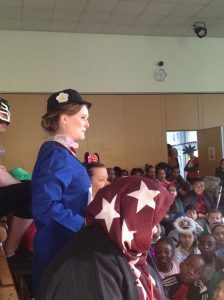 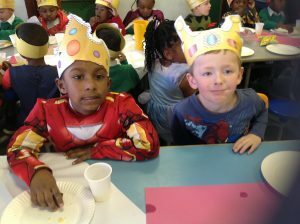 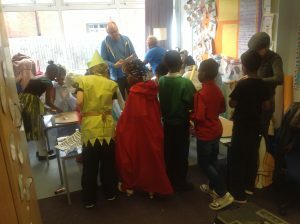 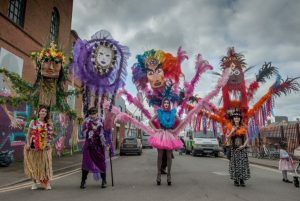 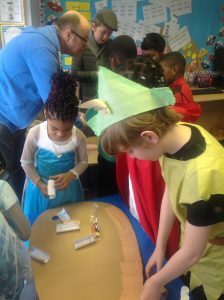 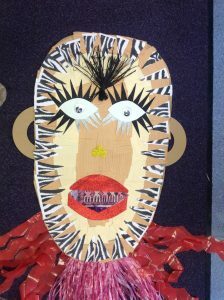 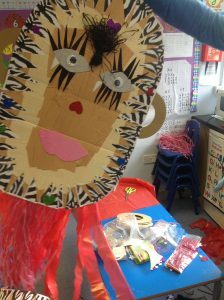 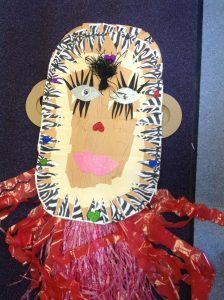 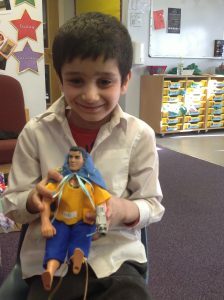 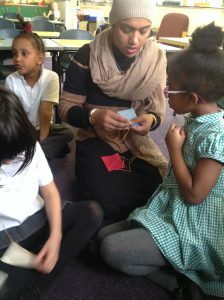 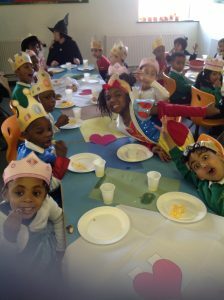 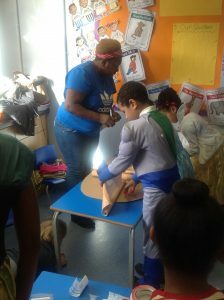 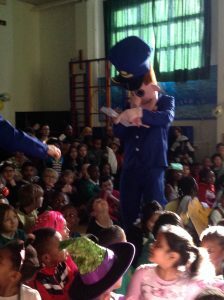 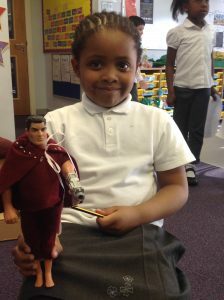 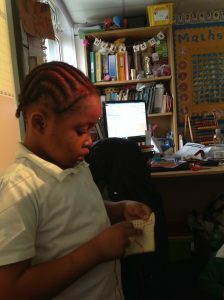 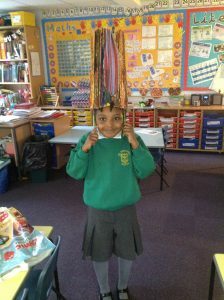 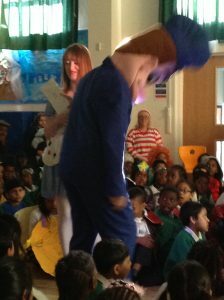 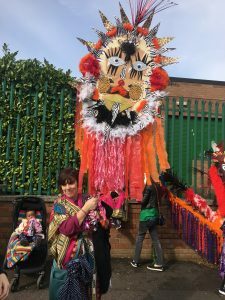 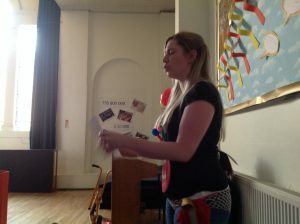 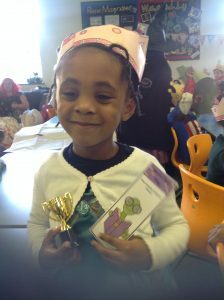 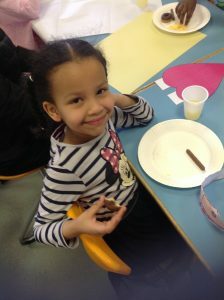 He worked with children and the parent coffee morning to make the costumes and the masks that we carried in the parade. 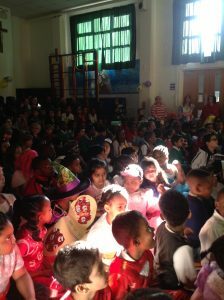 Please remember it is our class assembly next Friday morning at 9 o’clock in the school hall. 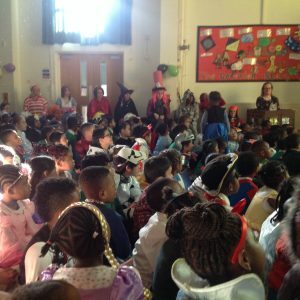 We we hope you can all come. 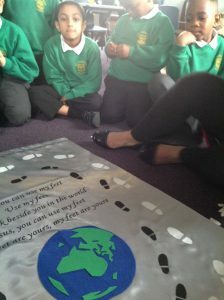 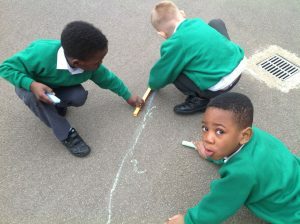 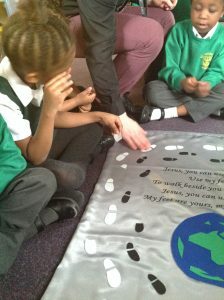 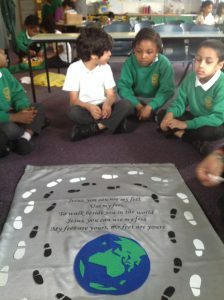 We have been talking in class about how Jesus told us to love one another. 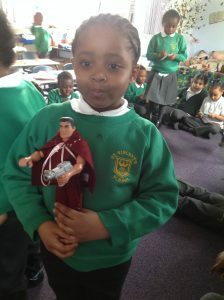 We have talked about who we love too. 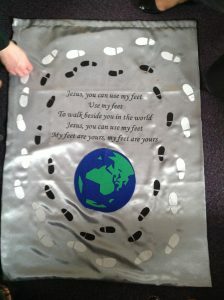 During our prayer service we played this song and we were all singing along. 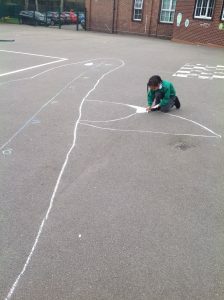 We really like it. 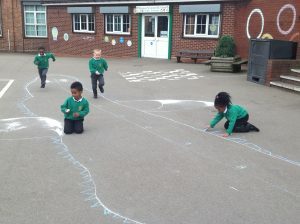 As part of our theme work we have been reading the book A Snail and a Whale by Julia Donaldson. 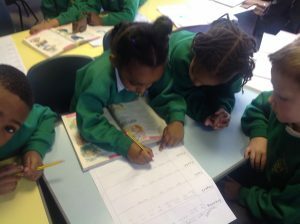 We have been lots of work about the book. 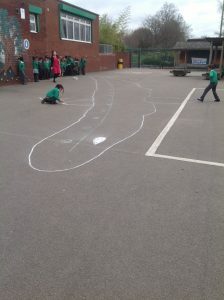 Today we decided to do some research and find out how big an adult humpback whale is. 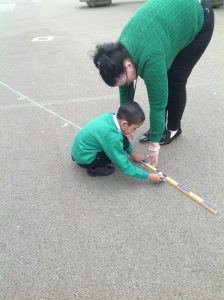 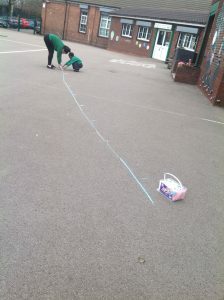 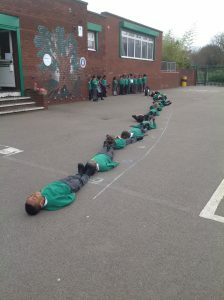 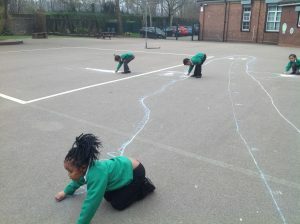 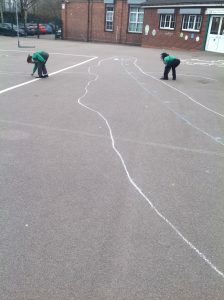 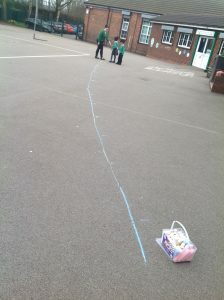 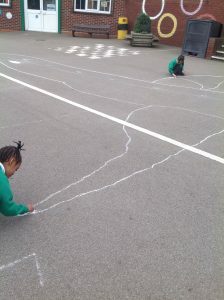 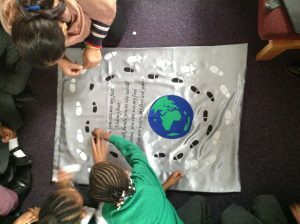 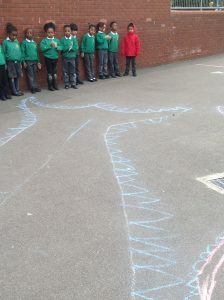 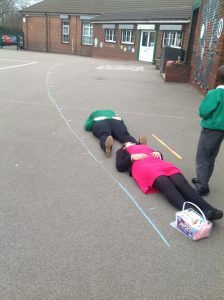 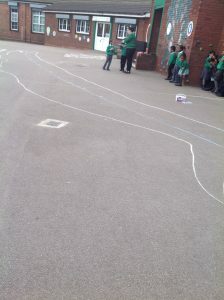 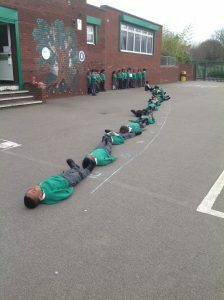 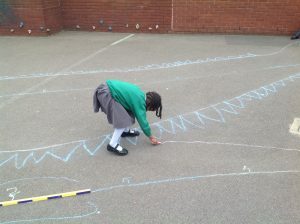 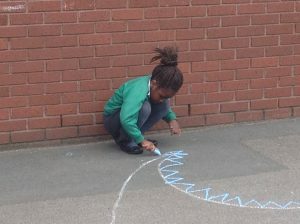 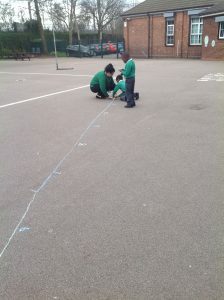 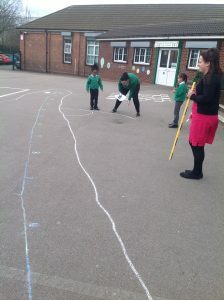 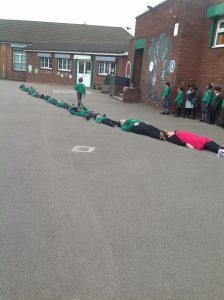 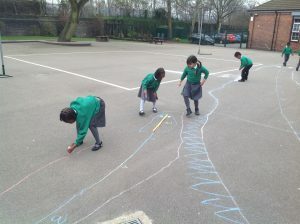 We used the internet and found out they can be up to 16 metres long. 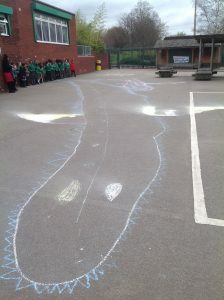 When a baby whale is born it is 6 metres long. 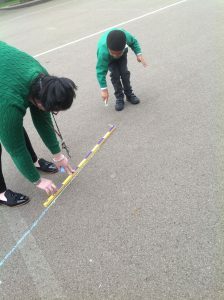 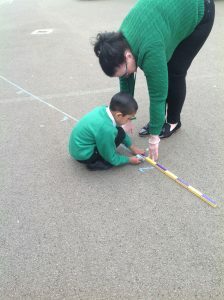 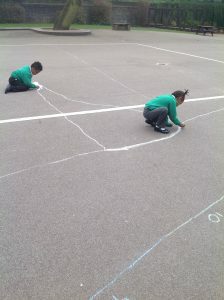 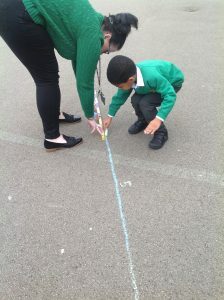 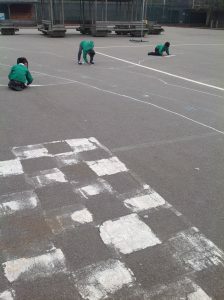 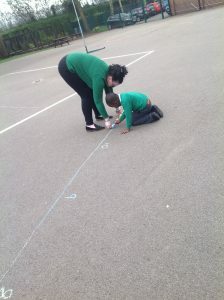 We took our metre stick out to the playground and the chalk and we measured how long 16 metres was and then we compared how big we would be beside it. 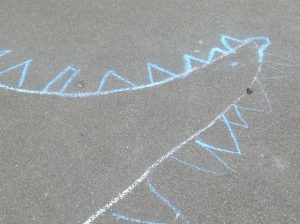 They are huge. 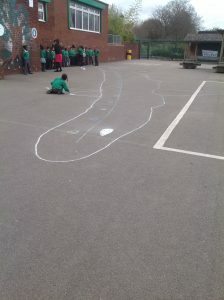 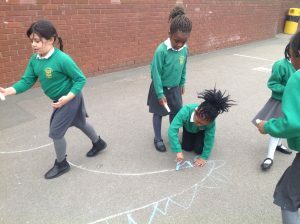 We then went on to draw the baby whale. 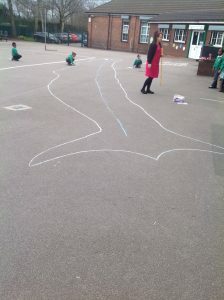 Did you know a baby whale is called a calf? 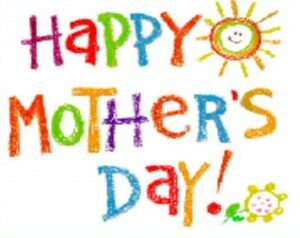 Did you know the mother is a cow and the father a bull? 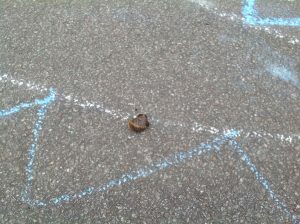 Together the family are known as a pod. 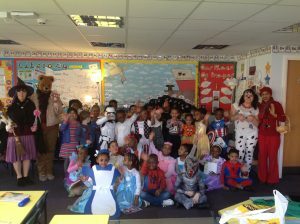 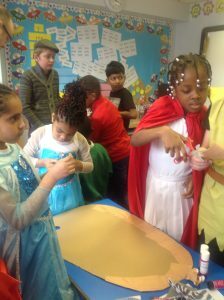 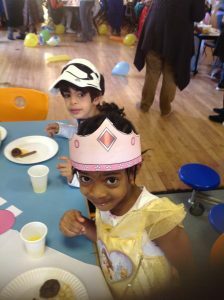 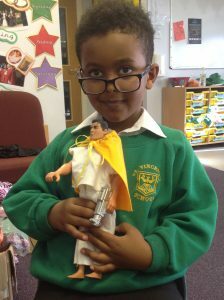 We had a fabulous day celebrating World Book Day we all dressed up as characters from our book. 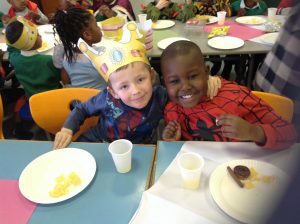 We started off the day by meeting our friends and enjoyed seeing their outfits. 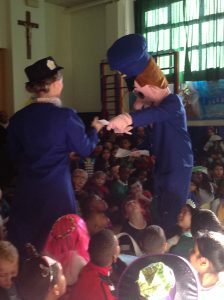 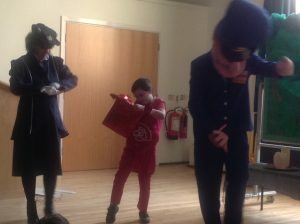 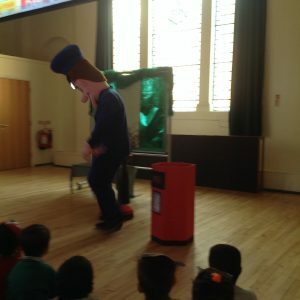 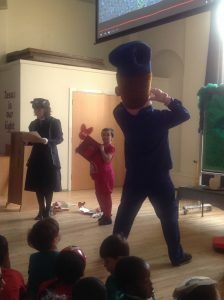 We then went to the hall where we met the Jolly Postman and all of special characters in the hall received letters. 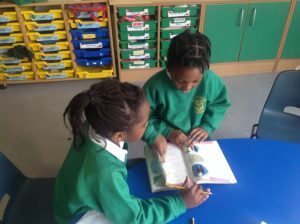 We read some books in class and talked about our favourite stories. 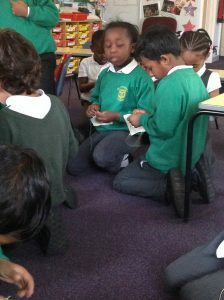 Then after lunch we went to the hall for an afternoon tea. 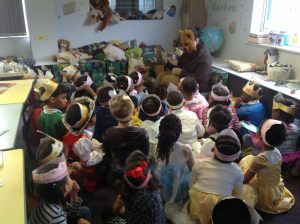 We think it should be World Book Day every day. 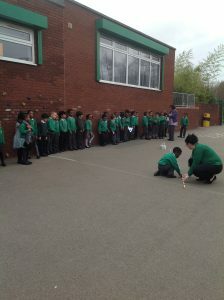 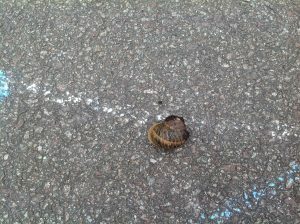 Have a look at the pictures. 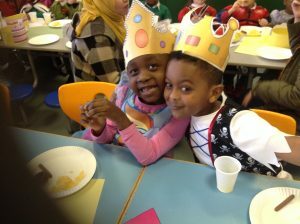 I bet you will agree that we look amazing. 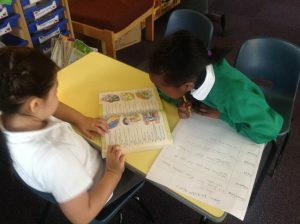 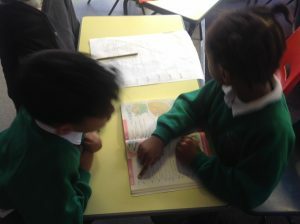 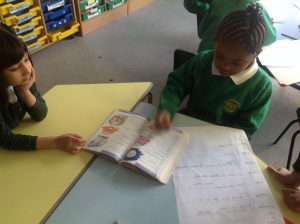 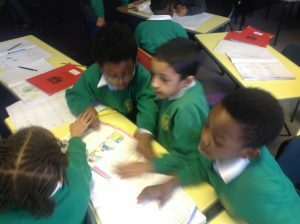 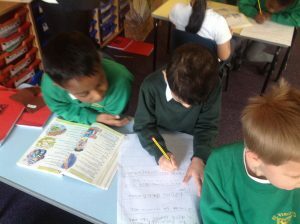 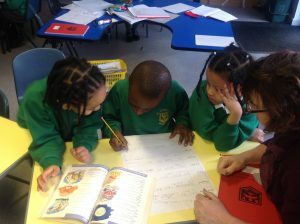 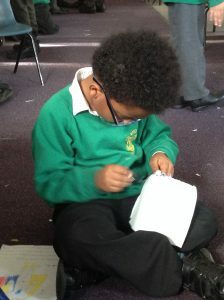 We have been learning how to find out the meaning of words by looking for them in a dictionary. 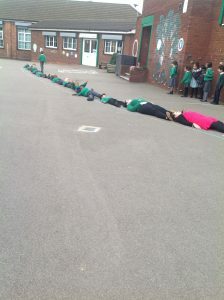 We worked together to do this. 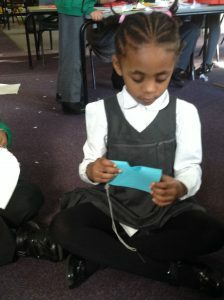 We are getting better at this and know we need to search for the first letter first and then letter by letter. 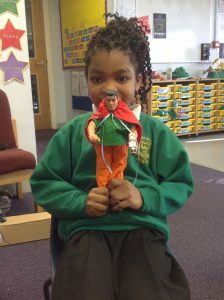 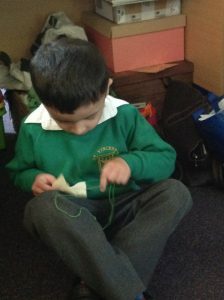 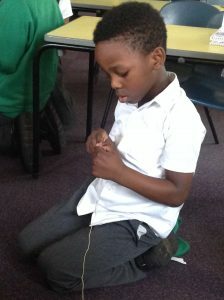 We decided that we wanted to make clothes for our Traction Man adventures. 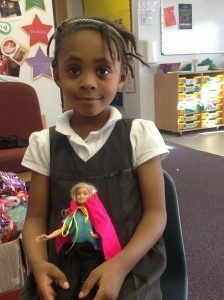 We designed outfits for the dolls. 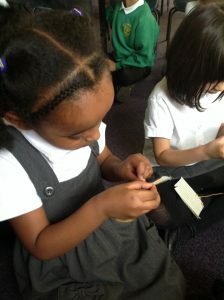 Before we could start making them we had to practice our sewing on pieces of material. 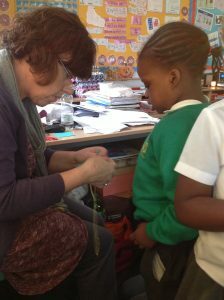 Then we started to make the real clothes we had to keep saying “under and over” as we sewed and this helped us not to get all tangled up. 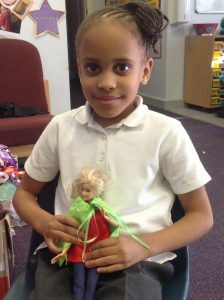 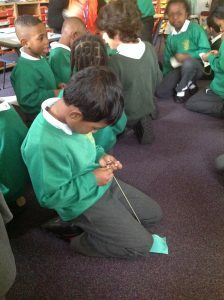 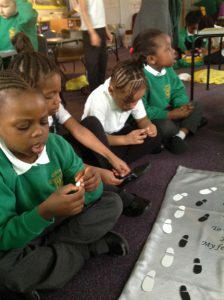 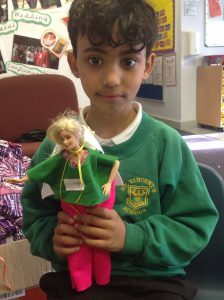 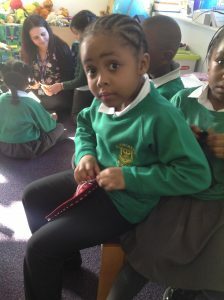 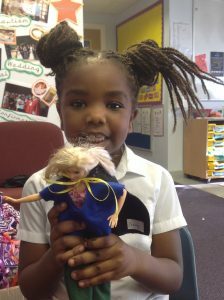 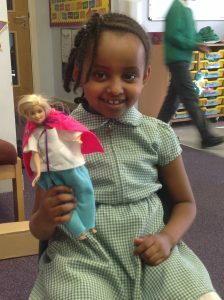 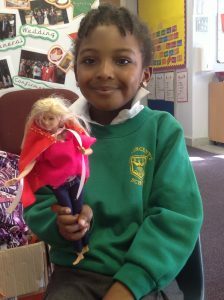 The clothes were great and we worked really carefully. 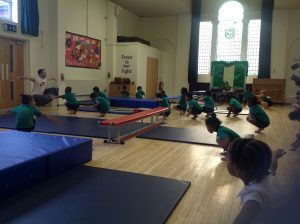 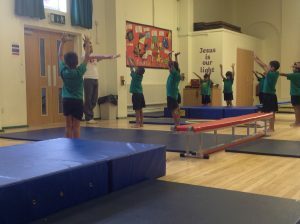 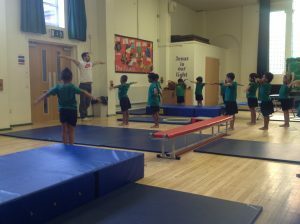 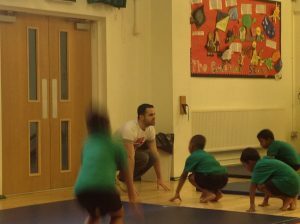 we now have gymnastics every Friday afternoon. 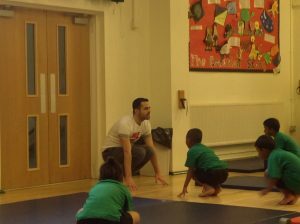 We really enjoy it and have been learning to do some great things with Chris.